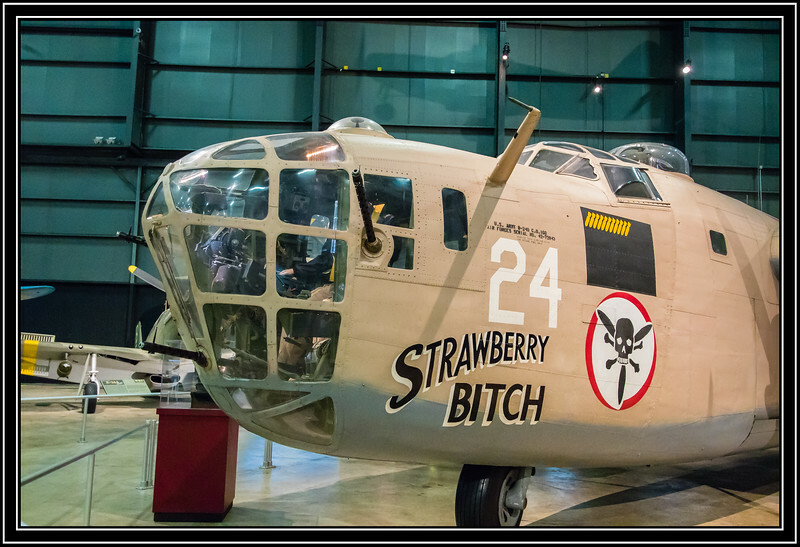 Dayton, OH - The National Museum of the United States Air Force- The Consolidated B-24 Liberator is an American heavy bomber, designed by Consolidated Aircraft of San Diego, California. It was known within the company as the Model 32, and some initial models were laid down as export models designated as various LB-30s, in the Land Bomber design category. At its inception, the B-24 was a modern design featuring a highly efficient shoulder-mounted, high aspect ratio Davis wing. The wing gave the Liberator a high cruise speed, long range and the ability to carry a heavy bomb load. Early RAF Liberators were the first aircraft to cross the Atlantic Ocean as a matter of routine. However, the type was difficult to fly and had poor low speed performance. It also had a lower ceiling and was less robust than the Boeing B-17 Flying Fortress. While aircrews tended to prefer the B-17, General Staff favored the B-24, and procured it for a wide variety of roles. The B-24 was used extensively in World War II. It served in every branch of the American armed forces, as well as several Allied air forces and navies, and saw use in every theater of operations. Along with the B-17, the B-24 was the mainstay of the US strategic bombing campaign in the Western European theater. Due to its range, it proved useful in bombing operations in the Pacific, including the bombing of Japan. Long range anti-submarine Liberators played an instrumental role in closing the Mid-Atlantic Gap in the Battle of the Atlantic. The C-87 transport derivative served as a longer range, higher capacity counterpart to the Douglas C-47 Skytrain. The B-24 was produced in very large numbers. At nearly 19,000 units, with over 8,000 manufactured by Ford Motor Company, it holds the distinction of being the most produced heavy bomber in history, the most produced multi-engine aircraft in history and the most-produced American military aircraft. At the end of World War II, the Liberator had been surpassed by more modern types such as the Boeing B-29 Superfortress. The type was rapidly phased out of US service, although the PB4Y-2 Privateer derivative carried on in service with the US Navy in the Korean War. Two B-24s, one LB-30B (contract version of AAF B-24A) and one Liberator V (Lend Lease B-24J) representing a B-24H, are airworthy as of 2016. [Wiki] Link to Photo Without Frame Thank You for Making this Daily Photo the # 1 Pick on 02-01-2018. A great shot of a great aircraft! Very informative info ! Fine shot of the nose !! The all glass !+$%pit (?) looks as if it would give good visibility--right in the midst of the action. Wow, this is indeed a fascinating aircraft - I do love the full glass nose. Nice shot. Fantastic capture of this old plane!